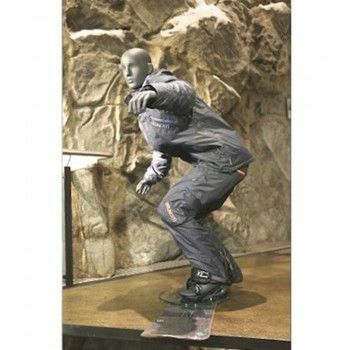 This sport is a human mannequin dummy snowboarder lightly drawn face.This mannequin is dedicated to surfing, snowboarding or snow sports. Its movement will give dynamism to your windows while highlighting your combinations collections, hats, bathing suits or surf and snowboard equipment. This mannequin comes with man rode a glass base that attaches to the calf. Mannequins Online offers you these men sports mannequins or mannequin surfing and snowboarding showcase. Beautiful sport man display mannequin with a fixation in the calf with a round glass base. It is the ideal combo for sports such as surfing, rollerblading. The dimensions for this model is 175 cm in height, a width of 125 cm and a length of 85 cm. 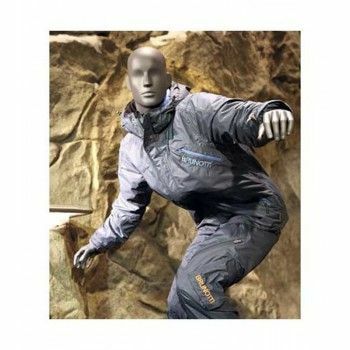 The delivery time for this beautiful mannequin man sport depends on the availability but is generally 2 weeks.